Cowboy Chaps Black by Gregg Homme. This is the real Wild, Wild West. Inspired by the gunslingers of classic cowboy movies, these black cowboy chaps are as Western as it gets. Steel black chaps designed with full fringe on both sides along seam line. Made from lightweight, faux suede material with slight stretch that’s soft to the touch. Black fabric is finished with a subtle metallic silver sheen. Cowboy chaps include elasticized waistband with a nickel-plated buckle and four adjustable belt holes. Can be worn alone or paired with similar underwear styles by Gregg Homme. Briefs in picture not included. 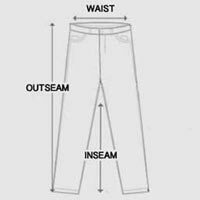 Model is wearing size M. For accurate measurements, see the table below.